Congratulations to Carlos, he is now a level 2 coach. This helps to keep our annual subscriptions at the same cost. Those who haven’t gone through local giving now need to pay the rest of their subs,or all their £100 please. Voting has now closed . Thanks to everyone who supported us. Great News We came 2nd and received £2000. We now have a parents’ rep for u10’s, Paul Angus (Raheem’s Dad). We now have a parents’ rep for u13’s, Maninder Sidhu (Sean’s Dad). Arjan’s mum has offered to help with the social side. We received a Magic Little Grant through the partnership between Localgiving and the Postcode Community Trust. 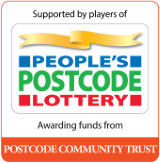 The Postcode community Trust is a grant-giving charity funded entirely by players of People’s Postcode Lottery. Our project received £500 to help support the club for coaching courses and new footballs and towards referees’ fees. Congratulations to the u12’s they are runner’s up in the second Division. U9 flyers reached the final of the vase in the development games. We have had confirmation that our Charter Standard status has been renewed for another year 2018/19, which means we get 5 footballs from Mcdonalds. Did you know that you can help support Golden Eagles Football Club for FREE just by shopping online? Localgiving and Give as you Live have teamed up so now you can shop at over 4,000 top online retailers and a percentage of every pound you spend will be donated to us – without it costing you a penny more! Step 1: Go to Give.as/localgiving, search for Golden Eagles Football Club in the search bar and select our cause. Step 2: Enter your name and email to sign up with Give as you Live. Step 3: Search for the retailer you want to shop with and start shopping! Once you’ve clicked through to the retailer’s website, just continue to shop as normal. That’s all! You’ll receive an email from Give as you Live within 1 to 7 days to let you know how much you’ve raised. Any questions? Call them on 0300 111 2340 or email help@localgiving.com where Fergus, Steph or Cara will be happy to help. Let them call you. Complete our form here and we’ll call at a time that suits you. Golden Eagles Football Club started in its present form in 1987. The U10’s play 7 aside,the u13’s play 11 a side, they play in the Thames Valley Football Development League (TVFDL), joining together Slough mini Soccer Friendly Scheme and Slough Soccer Combination. We play matches on a Sunday. The U13’s play home games at Kedermister park in Langley and the U10’s play at Stoke Park Trust.